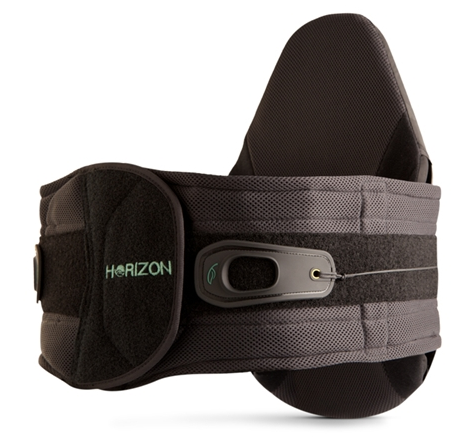 A popular choice from Aspen Horizon, the 631 LSO back brace can provide relief to those who suffer from acute or chronic low back pain. It’s low-profile and ergonomic design allows you to comfortably wear the brace under your clothing. Its adjustable sizing fits a variety of people, from those with a 24 inch waist all the way up to a 54 inch waist. With the addition of extension panels, the sizing accommodates even larger waists- up to 70 inches. Simply tighten or loosen until the brace comfortably fits your body. Its construction prevents the back panel from bunching up, allowing for a snug but flexible fit. With tri-band technology, this brace provides stability while allowing for effective compression and flexibility of the body. As with all other Horizon braces, the Horizon 631 LSO can be reconfigured to act as a Horizon PRO brace, allowing for continual treatment of recurring back discomfort. Lateral panels are included in this full back support brace to provide support on the sides of the spine if needed. Wearing this brace is easy and can be put on relatively quickly. Wrap it around your abdomen, overlapping the right side of the brace over the left in the front. Pull on the dual lacers to adjust compression levels as needed- the left for lower compression and the right for upper compression. Once the optimal levels of compression have been reached, secure the tabs to the front of the brace. Constructed of breathable mesh fabric, this back brace is easy to clean, and it should be cleaned regularly. Simply hand wash in cold water with a mild soap, rinse, and allow it to air dry before it is worn again. The 631 LSO back brace is a great option for post-op patients, as it’s able to provide several configurations to assist with the recovery process. If you or any of your patients are looking for a spine brace to assist with rapid recovery, this is it. MMAR Medical carries a variety of spinal back braces to assist with your back pain relief regimen.